AND YOUR LOCAL POSTIES !!!!! THE PRIVATE SHARE HOLDERS ARE GETTING FAT !!! Track 4 of 5 in this weeks run up to Willis Ellmore's 'Pop Life Crisis' E.P. "You don't engage properly with social media mate, you might as well give up." Track 3 of 5 in this weeks run up to Willis Ellmore's 'Pop Life Crisis' E.P. The media circus rolls on. Track 2 of 5 in this weeks daily stream of tracks from Willis Ellmore's Pop Life Crisis. 'Todays Video Is For You' is a critique based on the slew of youtube ‘how to make it in music’ videos from alleged professionals, no mention of artistry whatsoever...welcome to the saturated world of the 'creative networker'. In the run up to the release of Willis Ellmore's brand new E.P. Pop Life Crisis, we'll be uploading a track from it everyday this week. Track 1 of 5 is this gem featuring the vocal prowess of Dazzla (Lotek Hi-Fi/Big Dada). If you sign up to our mailing list here you get the track as a free download. And so begins this collection of beautiful noises via electronic signals with ambience and drums that uplift alongside an inner charm rarely felt these days. Belarus’ (a track written in the skies around 32,000 ft on return from a gig in Moscow that comes complete with hidden meaning). Anyone? Despite his tender years, the self proclaimed young, ghetto occupant and East Londoner has already worked with the legendary Mike Ladd and is also one half of Video Tourist with the inimitable A La Fu and to quote the young man, “I know its saturation point but I’m Willis Ellmo.” Pop Life Crisis print designed by Willis Ellmore with font designed by Remi/Rough is available to order (pre order only) at our online shop here. The latest Radio Va Va episode titled ‘The Sounds of One Summer’ is put together by A La Fu and Willis Ellmore and celebrates this summers road trip with our friends at Try Industries in the golden state of California. All tracks were either purchased, inspired, experienced or made whilst in this sunny disposition. We would like to send some love to New Zealand DJ institution Stinky Jim, the host of 95bFM show Stinky Grooves that encompasses the broadest beats and most delightfully robust rhythms sourced from all corners of the globe. 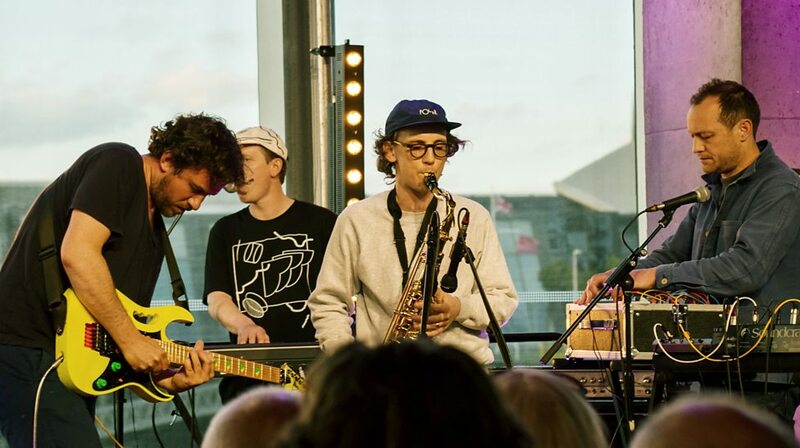 From the freshest reggaematical business to crucial cumbia, exceedingly eclectic electronics and a smattering of the most righteously rocking malarkey, the three hours of Stinky Grooves offers bountiful rewards to the attentive listener and their headphones. Stinky Grooves has been on air on 95bFM for the last 27 years and stands tall as one of the stations most established specialist shows and we are honoured to be included on one of the latest with A La Fu & Lotek's Care Home Dub from the latest Jacob Yates & The Pearly Gate Lock Pickers single...nice one Jim, keep on. The legendary Andrew Weatherall transmits our own Jacob Yates & The Pearly Gate Lock Pickers unfliching dub Care Home on his current NTS show Music's Not For Everyone alongside other finery. Tut Vu Vu perform at the Old Fruitmarket in Glasgow Sunday May 7th as part of Tectonics music festival which is curated by Ilan Volkov and Alisdair Campbell and proudly presented by BBC Scottish Symphony Orchestra. It takes place over the weekend of 6-7 May. Widewalls: Your first solo show in Italy titled Symphony of Systematic Minimalism will soon be on view at Wunderkammern Rome. Can you tell us something about the concept of the show and this new body of work? Remi Rough: The works for this show are without a doubt some of my best and most decisive works to date. I really tried to take a minimalist path to making the work but also to really expand on all the ideas I have been working on of late. I also decided quite early on to make a soundtrack / album to accompany the artworks in the exhibition. I have been producing music for a long time now but I’ve never connected my music with my art until now! I felt it was about time the two worlds were finally connected. A La Fu from Vava Records has really helped me make the album a reality too. I played him some demos and he jumped on board making the songs sound amazing and obviously releasing it through his label. I really wanted to try new things out with the paintings. I am definitely really happy with the result so far. I’m looking forward to seeing people’s reactions. I wanted to channel the abstract masters of old and make a stand for a genre art form that is still to this day wholly relevant. Widewalls: Your latest book titled “#RoughSketches. Volume 01” will be presented during the opening reception of the exhibition. What went into this book and what does it mean to you? RR: The book clearly illustrates just how the journey from wild style through to abstraction happened. It’s chronological too so you can physically see where some of those key moments happened. I started writing graffiti in 1984 but only used blackbook sketches from 1996 and onwards as that’s the point I became truly happy with the letters I was drawing. I guess it’s really important to me to have a legacy and narrative to where all this came from. It didn’t just happen overnight, it wound its way through decades of experimentation and development. Having a document that shows that journey is really important to me. It shows the provenance of the kind of work I now make. I am really excited about the special edition leather bound versions that the amazing Sandra Varisco has put together for the Wunderkammern exhibition. I think they’re going to be pretty incredible judging by the other work I have seen of hers. Widewalls: You have been pushing the boundaries of graffiti for over three decades, but you also have a 20 years-long experience in music production. How are these two forms of expression interlinked and how do they influence each other? RR: They’re both very similar actually… Both the way I paint and the way I produce music is done in layers. I create layers upon layers of either sounds or colours and see how they interact together. I guess the main difference is that with the music, I go into making a track with a lot more foresight than I do, a painting. There’s no point in just throwing a couple of sounds together and hoping for the best… I Like to think through each soft instrument and sound and work from sketches or sometimes start with a musical sketch and build that sketch into a finished piece of music. The paintings can sometimes be a lot more organic. I always work from drawings but once I begin, things can change very quickly. One example would be ‘Unconventional’ from the new show. It’s started as something completely different and took a completely different course as I was painting it. Widewalls: Over the years, your pieces have been becoming more and more abstract. Can you tell us how this progression came to be? RR: As a graffiti writer you literally write your name over and over again… I was always looking for interesting ways to achieve that. Be it straight letters or wild styles or bubble letters or whatever… As I got to a stage where I felt I’d done that enough, the letters began to abstract. As they abstracted more and more they became less and less like characters or typography and more like spatial, architectural plains. It was a slow progression really throughout the 2000’s. First I began to deconstruct the letter forms into simpler and simpler shapes. The ‘O’ became a small triangle and I would also exaggerate the sizes too. Then slowly and slowly I began letting go of all this traditionalist baggage and finding more interesting things in the space itself. Negative and positive. I began to understand that the paintings have to dictate the end result, not the painter. If that makes any sense? Widewalls: For several years now, you have been a part of the collective Agents of Change. Could you tell us something about these collaborative projects? RR: We started AOC in 2008 when Timid, LX One, System and myself were invited to Berlin to exhibit at the Bridge Art Fair. We went with practically nothing and ended up walking the Berlin streets pulling posters off the street walls and taking them back to our apartment to paint on and draw on. We made a massive installation of the posters and ended up signing with a Berlin Gallery and a Santander Gallery for subsequent shows. It really made us look at how and why we made work. We went home after the art fair and decided to start a super collective with all the best people in their fields. Slowly and slowly, we got there. We are 12 artists now from the USA, Australia, Germany, France and the UK. The following project was ‘The Ghost Village Project’ which was an abandoned village in the West Coast of Scotland that we turned into an art installation. We made a 12 minute documentary of the project and ended up winning a couple of short film awards for it and we never even had a press release for it. The idea of Agents Of Change was to explore space. To do something new and exciting without the baggage of selling or trying to monetise it. It’s purely about the art… We also started AOC around the same time of the banks crash so it seemed fitting for us. Widewalls: Since it usually occupies a public space, what is the power and responsibility of street art today? RR: I think street art and any public art really has an obligation to engage with the public. It’s always for them really. I don’t think all art has to be in any way political as such. I believe that just by actually being artists we’re making a political statement. It doesn’t have to be super obvious all of the time. The power in any piece of art is its ability to create emotions with the viewers. That’s what I like about painting murals. It’s all about the viewers in the end… I like that it transforms the environment into something other than what it was meant for. Widewalls: Who are your influences, and whose work do you appreciate the most today? One of my favourite current artists is Steve More from Edinburgh. You should definitely give his work a look if you don’t already know it. RR: It’s funny, but I ended last year with a solo show at Speerstra Gallery in Switzerland and had nothing in the diary, then by Christmas suddenly I had a solo show in Rome, a museum show in Roubaix curated by Magda Danysz and a group show in New York curated by Lori Zimmer. So it all became very busy very quickly. I am also working on a huge monograph for release next year and some mural projects in Bellinzona, Monaco, Washington DC and some I have been working on a special edition graphic for the new Nike Air Woven release. I keep pretty busy. It’s hard work being an artist sometimes but I love it too. On top of all the work, I have to try and spend as much time as possible with my wife and daughter and we’ve been renovating our home which is a little like having a whole other job. Featured images: Remi Rough, photo by Marco Cavarischi. All images courtesy of Remi Rough. 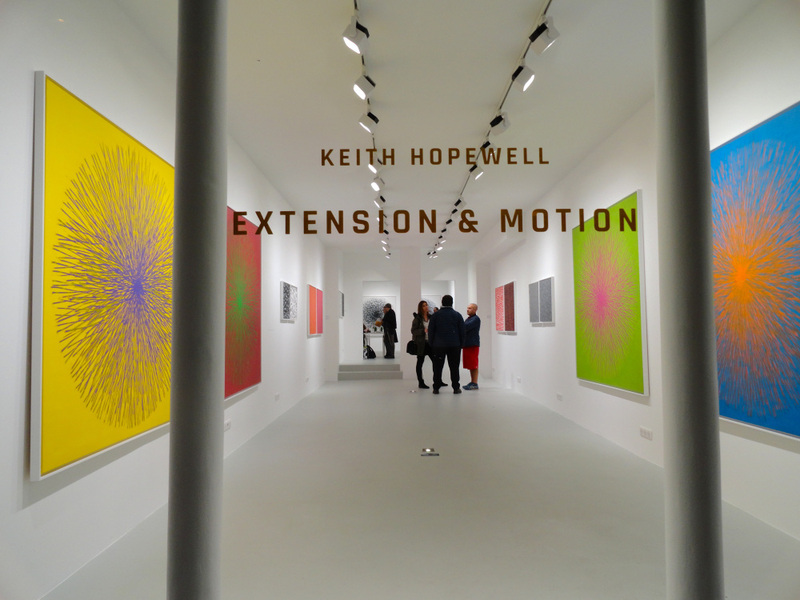 Extension & Motion, is the first solo exhibition in France by British born artist Keith Hopewell, exploring the boundaries of contemporary colour language in an age of digitisation, through a new series of gestural paintings. 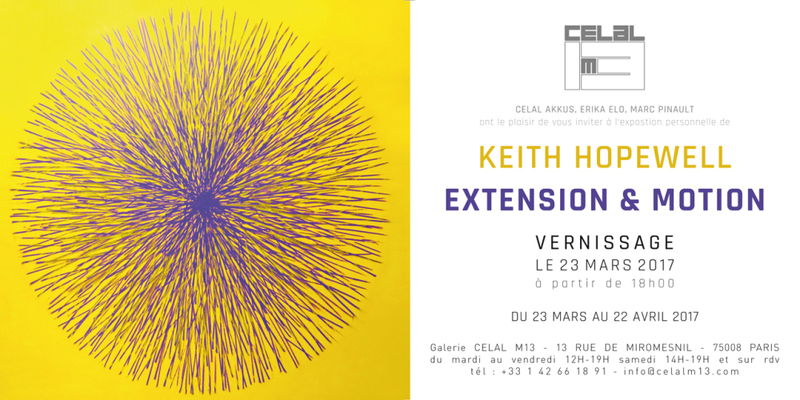 Each work is conceived with a minimalist palette of either two or three colours, as Keith physically obliterates each surface with the bombardment of primal marks, ultra fine lines, points and chromatic luminosity, building up morphic fields transmitting at different spatial frequencies. Hopewell’s past work is predominantly about the transformation of materials, and sound whilst, allowing the process of activity andperformative elements to become visible, through a synthesis of deconstruction/re-arrangement of surface and object. Notable work includes his reality charged pieces, where he incorporated painting with sculptural objects, such as steel security fences, and wire mesh, to re-orientate us and affect our perception, due to the parallax nature created by the two planes. In this new show, Hopewell’s use of interspersed colour invokes physiological effects, and time delays, through the use of subjective colour, simultaneous and successive contrast, and also the assimilation effects of Von Bezold, where the multitude of point and line is worked across the compositions at high and low spatial frequencies. There is some reflection back to Hopewell’s earlier interest in digital printer marks and CMYK, but the work in this exhibition appears to be more about the human touch, and the performative elements of painting, in an era described by Rosalind Krauss as being a post-medium condition. In an attempt to understand such a condition, Hopewell’s objective here, is to find solutions that enable painting to reach out beyond itself, and establish a self-redefinition to determine where the edge is, or locate a central nexus, in the midst of today’s massive image circulation. To question paintings specificity, in a search to find any new sustainability for such a medium, is to flow off this tension and try to both regulate or de-regulate it, by embracing painting as performative time. What we are seeing here, is the residue of events, the echoes of action and refraction, linger like the absent colours that merely exist objectively for the eye only. For Hopewell, the essence in the act of painting is located in the movement of the body, in the stretching out of the hand, to communicate his internal mental cognition onto the fabric of the external landscape. A sort of turning outward, what is not visible at the beginning of the process. If painting can mark time, then each mark here seemingly cancels out time. In the liminal moment resulting from the repetitive application of line upon line, he is able to deliver an explicit level of accuracy of straight vectors, not normally achievable by a hand in motion. In fact, the use of the spray medium in these works, questions the very idea of human touch, due to the anamorphic nature of spray, and its release of pressurised paint through a valve system. Theres a sort of refraction at work in his ritualistic process, like an unknowable reality, passing obliquely through the interface between one medium and another. This direct presence of activated mind architecture, resonating from the body to form a composition on the flat plane, echoes George Berkeley’s notion; “Nothing can exist without a mind to perceive it, the external world must exist within the mind of god.” Along with the harmony and contrast of spatial colour interspersions, this exhibition is really about reaching a point of purity, a sensory or meditative experience, where we can interpret painting with what he believes has the possibility of outliving itself at future points in time. 2023 The Triptych Trailer One. No border, no nations. Love one another. F*ck Nazis. Remi Rough (London, 1971) is one of the greatest exponents of abstract and urban art. Engaging in the UK art scene of the 80s, he has pursued his research both in the gallery space and through public interventions. The artist combines the purism of avant-garde movements such as Suprematism, with a totally modern expressionistic energy to create powerful abstract compositions. His synthetic yet dynamic lines and neat geometric colour forms, whether on walls or on canvas, acquire an almost sculptural dimension. Remi Rough has exhibited in important international institutions and events such as the Biennale of Street Art in Moscow, the Museé Mohammed VI in Rabat, the MB6 Marrakech Biennale, the Urban Art Biennale at the Völklinger Museum, the Museum of Fine Art of Santander and the Maison De L’Architecture in Strasbourg. Symphony of Systematic Minimalism, Remi Rough’s first solo exhibition in Italy, explores the relationship between visual art and music. With an experience in music production of over 20 years, Remi’s artistic and musical expressions have always been intrinsically linked. As music’s abstract language, the visual elements in Remi’s paintings become a chromatic system of pure forms. His works colours, lines and shapes are modulated as visual “chords” in musical composition, resulting in a dynamic and precise structure where nothing is arbitrary and everything is in it's right place. Each painting, along with the musical composition created especially for it, acquires a temporal dimension, evolving in time and becomes an experience. For his show at Wunderkammern, Remi Rough will present large scale works on canvas together with music written and produced by the artist. He will also present artworks on paper along with a site-specific installation in the gallery. On the occasion of the opening, the book #RoughSketches Volume 01 will be presented, together with a limited special edition created by Sandra Varisco. Remi has produced a 9 track album as an exclusive release with us that directly correlates to the paintings within the show. This is the first time Remi has explored the natural connection of his artwork and his music making. The 9 songs reference his artistic and musical influences from as far a field as John Carpenter and Aphex Twin to Futura and Marcel Duchamp.